Thai Kuen Museum No. 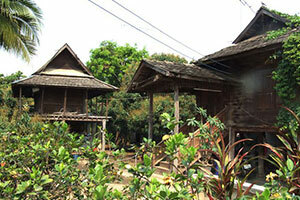 20/1 Moo 7 Ban Ton Haen Noi, Tha Wang Phrao ,San Pa Tong district Chiangmai Province. Operation since 2505, began collecting coins. The ancient capital The family silverware. Then collect belongings before such a trap animals, farm tools. And ritual of the village and the neighboring communities. To gather the evidence of the culture. And to conserve supplies. By asking for donations from relatives and bought with their own money. Purposely To collect supplies of the Tai Kuen people interested to learn. And recognize their roots and their ancestors. And for anyone interested. Travel by car along Highway 108 (Chiang Mai - Hod) Km at 31-32 and then turn left to find a Hand Loung market and U-Turn look left into the path beside the address capital market. Then traveling along the location Ban Kat about 1.5 kilometer And And over the bridge to the Ban Ton Hand Noi intersection corresponding to approximately 100 mete.